Ahh! I have been sooo busy lately! The lack of posts is partly due to the fact that my computer broke in November but also because my life has been so crazy (in the best way). I wanted to give you a little life update from the past couple of months. I have a great group of friends in my English class this year and they have got to be one of the best things that has happened to me this school year! 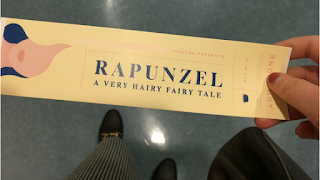 One of the girls in my friend group is in theater so in November we went to support her and watch her perform in Rapunzel. The rest of us (there are five of us in total) all sat together and the play was a children's interactive play so we had fun laughing and interacting with the performers. For my little sister's birthday we went to Reunion Tower in Dallas. If you have no clue what that is it's the cool building in the picture right after the Rapunzel pictures. They have a viewing deck at the top of the building where you can go outside and see all of Dallas and the surrounding areas. I had a ton of fun but since it was so high up it was freezing! I have recently found a new hobby which is going to brunch at cute restaurants with McCray on the weekends. We found this little soda fountain in town that is adorable and they serve some of the best food! My go-to when we visit is half of a BLT (or bacon sandwich as I call it) and a cup of tomato basil soup, it sounds kind of weird but it's wonderful! I got a scoop of sherbet ice cream and all of their desserts are served in cute little containers like this mason jar! I must say, I am very proud of myself for this accomplishment! 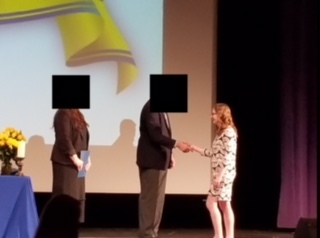 I was inducted into National Honor Society in November! It honestly feels so good to see that all of my hard work in school is paying off! So sorry for the awkward black boxes, for the privacy of my teacher and principal I covered their faces. I went to my first college meeting! Earlier this month SCAD (Savannah College of Art and Design) had a college meeting and workshop at the Ritz in Dallas. Because the school is in Georgia it was nice to learn more about the school without having to travel all the way to Georgia. My mom had never heard of this school before and would not take me on a tour of the campus without learning more about it and this meeting gave us both all the necessary info! Let me just say I've already planned on visiting the college this summer! Because the meeting and drawing workshop were all day they had breakfast for us and it was fabulous! They had bubble tea, a fruit bar, three different coffee drinks, bacon and eggs, and best of all a DONUT WALL!! Look how cute it is! I guess the glory of this donut wall doesn't really show through in the picture but the whole wall was lined with donuts and they had donut trees as well. The donuts were no ordinary donuts, there were oreo donuts, peanut butter and jelly donuts, chocolate fudge donuts, and best of all bacon donuts! The hotel is gorgeous and I just had to take a picture by the piano. I thought I would throw this picture in here to give you a little update on Pudge. He is getting so big! I got him to sit still just long enough for me to take this one picture and then he lost interest, he's worse than a toddler! A couple of Saturdays ago, my mom, little sister, and I spent the day in Dallas. It was a total girls day filled with hair cuts, Christmas shopping, and fun treats! There is a popsicle place in the Dallas area that I have been dying to go to called Steel City Pops, which I heard about in one of Brooke's posts and she is always eating at fabulous places so I knew these popsicles would be delicious! I finally had the chance to go that day and the popsicles were better than I had imagined! I got one of my favorite dessert flavors, pomegranate! All of the popsicles are made right in front of you. There are places that you can sit up against glass so you can watch the popsicles being made! This is a picture of all of the popsicle sticks lined up before they were used in popsicles. Right across the street from Steel City Pops is JOY Macaroons and I was having such a hard time deciding as we were pulling up which one I wanted, a popsicle or macaroons but I was able to work my magic and get my mom to take us to both! We ate our popsicles in the restaurant and got macaroons to go. 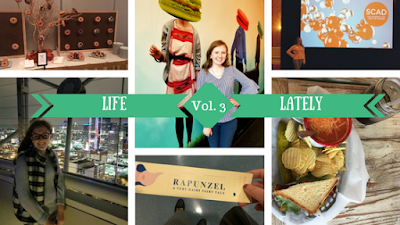 So now that I've caught you up on all the latest in my life I can't wait to get back on my regular blogging schedule!